U.S. Air Force photo/Senior Airman Benjamin Sutton. Click on thumbnail for higher resolution. A photo published on the website of Mountain Home Air Force Base shows a Republic of Singapore Air Force (RSAF) Boeing F-15SG Strike Eagle landing at Eielson Air Force Base, Alaska for Exercise Red Flag 13-1 on the 3rd of October. The aircraft belongs to the Buccaneers of the 428th Fighter Squadron, 366th Fighter Wing. 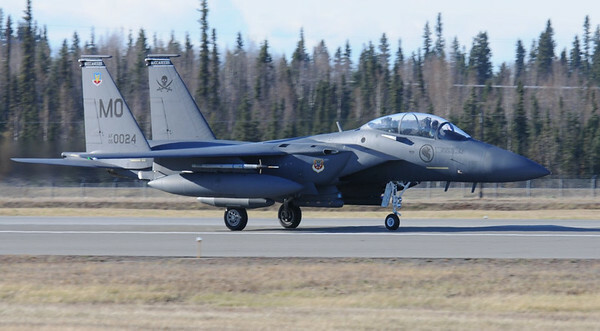 The squadron is a joint RSAF-USAF training unit, otherwise known as the Peace Carvin V Detachment, which trains RSAF pilots on the F-15SG at Mountain Home AFB, Idaho. What's interesting about this aircraft is that its serial number, 05-0024, confirms that the last of the 24 RSAF F-15SGs currently on order for the RSAF has been delivered. Notoriously secretive, the RSAF does not usually announce news of aircraft deliveries (save for initial rollouts or the first delivery of new types) and the only way for spotters and enthusiasts to keep track of such deliveries is by noting the serial/FMS numbers on its aircraft on the occasions they appear in public. During the Singapore Airshow 2012 held in early February, the 23rd aircraft (05-0023) was on the static display in the markings of Paya Lebar-based 149 Squadron carrying the RSAF serial 8328. At the same show, I attended a media conference where Roger Besancenez, Vice-President of Boeing's F-15 program, revealed that the last aircraft will be delivered later in 2012. So it seems that the delivery has happened, and the aircraft is now one of eight from the Buccaneers taking part in Red Flag Alaska. Singapore ordered twelve F-15SGs with a further eight options in December 2005 after an exhaustive selection process. These options were converted into firm orders and a further four aircraft were added to the order in October 2007. The first F-15SG was rolled out in November 2008, with the 428th FS standing up in May 2009 to receive its first aircraft. The first F-15SGs arrived in Singapore in March 2010, operated by the Shikras of 149 Sqn based at Paya Lebar, transitioning from the Northrop F-5S/T Tiger interceptor.